Last week, a person asked me for an advice about buying a new laptop. The most important thing when giving any advices is not just recommend what’s good for you, but rather put yourself in the shoes of the advisee and understand his/her computer usage patterns. Here’s the quick profile of this person, let’s call her Mary. Mary is using the computer a lot, but she’s afraid of it. She’s retired and travels a lot. 80% of her activity is browsing Internet and using Yahoo! email. Once in a while she needs to scan document, use Microsoft Word and Excel. Currently she’s using a five years old notebook with Windows OS. Money is no object. Each member of my family has Apple’s MacBook, and in my opinion it’s a better build device than any Windows-powered notebook. 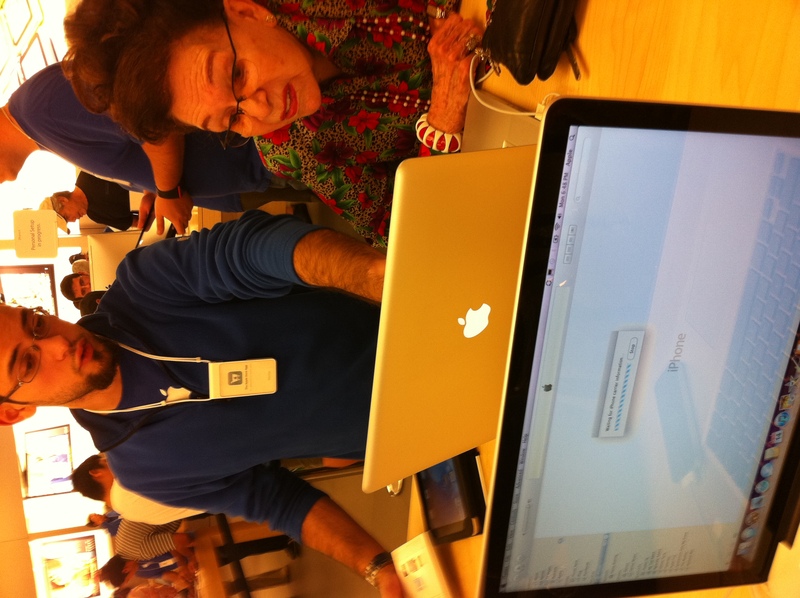 I went with Mary to the closest Apple store, and she purchased this feather light MacBook AIR with 13” monitor for $1299. Yes, she could have gotten a Windows notebook for half of this amount, but Mary deserves to not only having a computer, but enjoying it too. The goal of this writeup is to create a short list of things that may seem unusual to a not proficient computer user switching from Windows to Mac OS. This row of icons at the bottom of the screen is called “dock”. Clicking on the icon starts the corresponding program. You keep there only the programs you use the most. To remove unwanted program from the Doc, press the trackpad with two fingers at the same time (an equivalent of clicking on the right mouse button) and select an option “Remove from dock”. No worries, you are not deleting this program from your computer – this just removes the icon from the dock. At first, you may have a hard time trying to properly press the trackpad with two fingers to open the right-mouse menu. The other way to do it is by pressing the trackpad with one finder while holding the control key. If you know the name of any program that you’d like to start, but its icon is not shown on your dock, click on this little looking glass icon at the right top corner of your monitor (a.k.a. spotlight), and start entering the name of this program. A dropdown window will show the list of files where this combination was found. Click on the one from the Applications section to start this program. When the program runs, you’ll see its icon on the right side of your dock. If you want to keep this program at your dock for the future, make another two-finger push on your trackpad and select “Keep on Dock”. The most important thing while learning how to drive a car is how to stop it. On the same note, you need to learn how to properly quit the program. In Windows, clicking on this little cross on the top right corner closes the window and quits the program. In MAC OS you’ll see three color bullets on the top left corner of the window, but clicking on the red bullet closes the window without quitting the program. Do this experiment: start Safari Web browser from your dock by clicking on the icon that looks like compass. In the left corner of the top Safari’s toolbar you’ll see the word Safari, which is the name of your current program. Now open the Finder – its window will cover the one from Safari, and the Finder’s top toolbar is displayed. Finder is your current program. Now click on the red bullet in the top left corner of the Finder’s window to close it. Now you can see the Web browser’s window, but the top bar on the screen still stars with the word Finder and has its menus. Isn’t it weird? The reason is that you just closed the Finder’s window but never quit the program. To do this, press the buttons command and a letter Q simultaneously. Q is for Quit, and now you see the screen that makes sense to you: Safari’s window is open and the top toolbar is also from Safari. You can quit almost any current program (except Finder) by pressing the buttons command-Q. The other way to do this is by clicking on the name of the program on the top left corner and select the menu option Quit. Don’t panic if you closed all windows from any program (Safari, Finder, et al. ) by mistake. If you see a top menu of the program but no windows opened, press command-N to open a new window. If in Windows you’ve been using the combinations of keys that included Control, get used to the fact that the button Command may become a replacement for Control. The button Control is still there, but if you run into a situation when it doesn’t behave as expected, try to use Command instead. For working with files in Windows you use File Explorer. In Mac OS you use Finder, which is usually presented by the first icon on the left side of your dock. Get ready for a big surprise – there is no c: drive there. All files are simply organized in folders. After starting Finder, look at the bar with devices and places on the left. Desktop is a place with the files that are always shown as icons on your monitor. Try not to copy too many files to the Desktop as it’ll clutter your monitor. There is another folder called Documents, which is an appropriate place for your documents. You may find a folder Downloads, which is the right place to keep all the files that you download from the Internet. To create a new folder within a folder, open the parent folder by double-tapping on your trackpad – make sure you’re in the right place by checking the title of the Finder’s window – it shows the name of the folder you’re in. After that press the three buttons command-shift-N and this will create a new folder – just enter its name. To copy files from one place to another, select the files, open the right-mouse menu, and select there the option Copy Items. Then open your destination folder, and select the option Paste Items from the right-mouse menu. One of the simplest ways to copy important stuff is by placing it on the USB Flash drive. Buy one of these that can store at least 8Gb of data. Besides, it becomes handy if you want to bring some important documents or photos from you old Windows computer. After inserting this flash drive into your USB port, notice the new name in the Devices section on the left side of you Finder’s window. In some cases your flash drive will have a name, in some cases it’ll just be shown under the title “No Name”. Next to this name you’ll see a little underlined triangle. Each time you want to remove the flash drive from the USB slot – click on this triangle. This process is called Eject. Don’t expect the flash drive to catapult form your notebook – it’s just a safe way of unmourning an external device. Each program has its Preferences menu, where you can tune this program to look to your liking. The Preferences menu is usually located in the drop-down menu that opens up when you click on the name of your current program on the top left corner of the monitor. Your dock also has the icon called System Preferences, which allows you to adjust the overall setting or configure devices. This is an equivalent of the Control Panel in the Microsoft Windows world. MacBook comes with a simple text editor called TextEdit. You won’t find its icon at the dock, but go to the spotlight (top right corner of your monitor) and enter TextEdit there. Then start it, and if needed, keep it on the Dock as described above. If you want more advanced text processing, you can either purchase Microsoft Office for Mac, or purchase the Apple’s program called Pages – it costs $20 and you can import all your Microsoft Word’s .doc files there. For another $20 you can get a program called Numbers, which may serve as a replacement for your Microsoft Excel. One of the reasons of why Apple computers are so successful is their excellent technical support. First of all, they run introductory classes for the new MacBook converts. If you run into any issue with your computer, make an appointment at your closest Apple store at so called Genius Bar. These guys are good and friendly, and most likely, after visiting the Apple store you’ll become a happy camper again. Apple maintains a Web site for people who are just starting with Mac. Enjoy your new Apple computer! Good one. I think she will be very happy with her new laptop. I’m sorry. My previous post was from wrong account.